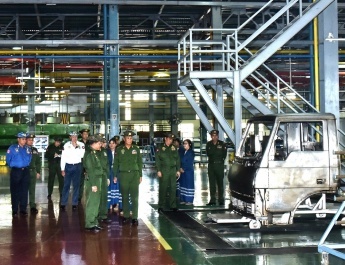 Commander-in-Chief of Defence Services Senior General Min Aung Hlaing thanked China for its stance on and support for Myanmar after the former has known the true situations of Myanmar on terror attacks of extremist Bengali terrorists in Rakhine State and follow-up issues at a meeting with Minister of Foreign Affairs of the People’s Republic of China H.E. Mr. Wang Yi at the Parlour of Zeyathiri Villa in Nay Pyi Taw this evening. 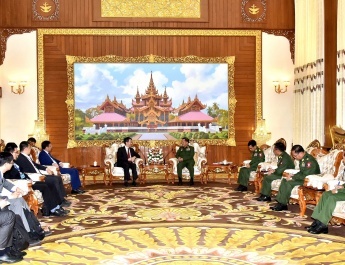 Then, the guest minister urged him to maintain peace and stability in Rakhine State, carry out regional development tasks and re-accept Bengalis who left for Bangladesh under the law. 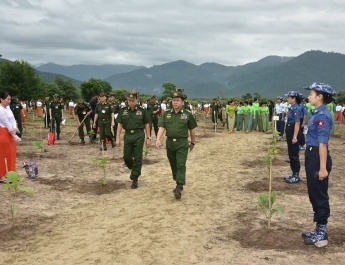 Afterwards, both sides cordially exchanged views on needs to disseminate true situations in incidents of Rakhine State to the international community, plans of China to provide assistance for carrying out tasks of peace and stability and development in Myanmar, and further promotion of friendly ties between the two countries through strengthening relations between the two armed forces. 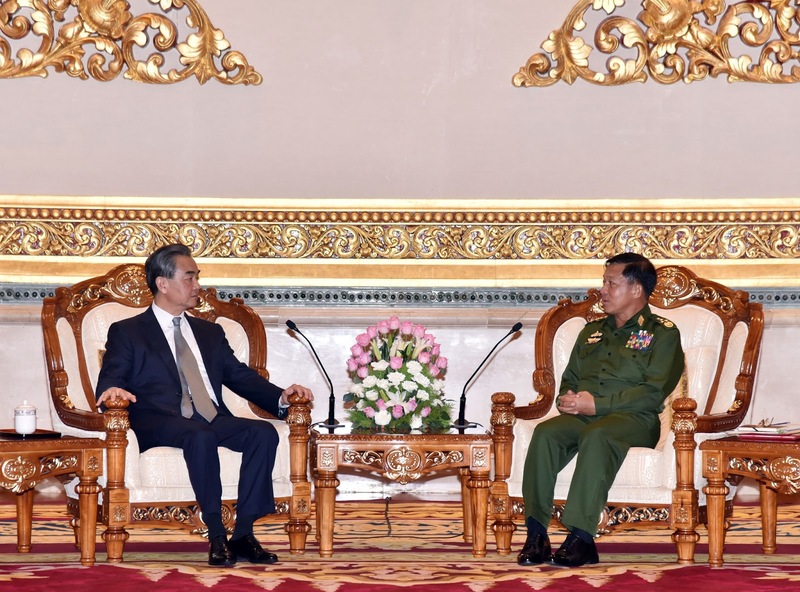 Also present at the call together with the Senior General were Lt-Gen Soe Htut of the Office of the Commander-in-Chief (Army) and senior military officers. 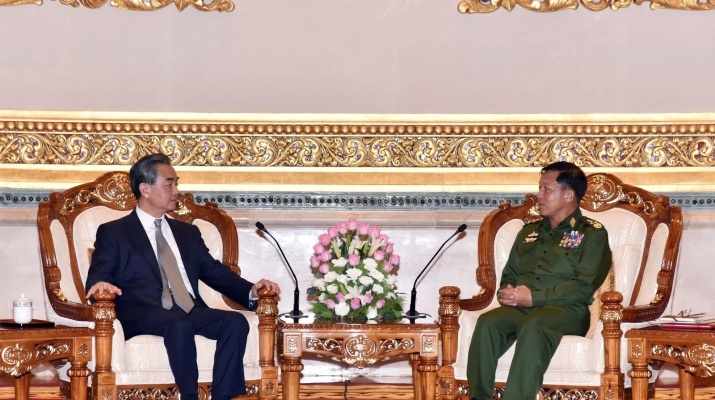 The Minister of Foreign Affairs of PRC was accompanied by Chinese Ambassador to Myanmar H.E. 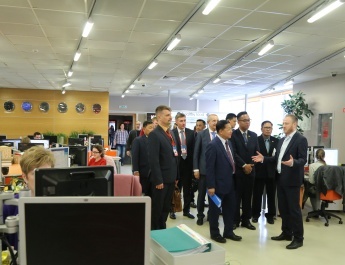 Mr. Hong Liang and officials. After the meeting, the Senior General presented the commemorative gift to the Chinese Minister of Foreign Affairs and they posed for documentary photo together with those present.